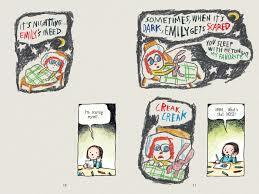 It's from this comic strip that Henrietta originates, along with her black and white cat Fellini. Henrietta is wonderful in her ordinariness, with her one companion, the speechless but nonetheless expressive Fellini. She's given a box of coloured pencils "as close as you can get to owning a piece of the rainbow." 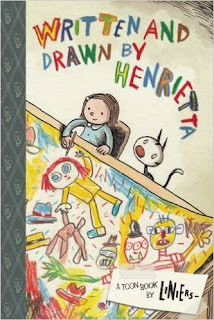 She launches right into making a comic, and the story divides in two from here on as Henrietta's own drawings tell her story, while the comic's style of pictures talk about what she is doing. This is super clever, as Henrietta does all her decision-making about what's going to happen next in the story in the accompanying comic panels. She really tells a great scary story about a character called Emily who is in bed at night and gets scared, clutching her toy called My Favourite, while scary noises get closer. A three headed, two armed, four-footed monster (called Huey, Dewey and Louie Bluie) emerges from the wardrobe (of course, isn't that where all monsters hide? ), upset because only two of their heads have hats. Emily joins them exploring the gigantic interior of the wardrobe, meeting a zombie mouse who directs them to the hats (of many kinds, all labelled by style from newsboy to porkpie to one I'd never heard of, the phrygian cap. They must choose and quickly flee before another monster arrives - the one-headed monster with three hats. When all is finally resolved Emily is given a special present but you'll have to read the book to find out all the details. 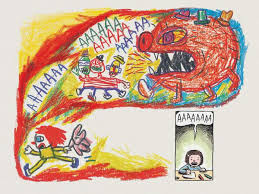 The Henrietta panels do useful things to talk about making up a comic and the problems/steps therein: "Thinking up new ideas is always the hardest part." "In a good story, there's always something that happens 'suddenly'!" "Those three little dots really add... ... SUSPENSE!" "The best things are the ones that make you say WOW!" Although there are two stories going on at once it's all done with such perfect pace and style that it's a pure pleasure to read alone, or share with a child. TOON Books is a terrific series of graded comics on three levels - for brand-new readers, emerging readers and advanced beginners (nice terminology). (This book is Level 3.) So obviously designed to make comics a worthwhile part of the school curriculum, and I can so imagine how kids would love to have a book like this to read rather than some of the more ordinary texts they are presented with. Details of the levels and a 'Tips for Parents and Teachers: How to Read Comics with Kids' guide is in the back of the book. Also checkout their website also has free online cartoon makers, lesson plans etc. 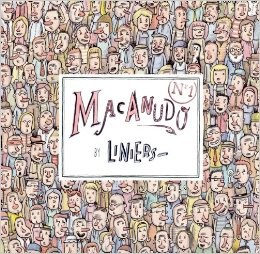 I'm definitely going to check out more from both Liniers (who has one other TOON book) and more from the TOON stable, and maybe even make a comic or two myself, and perhaps try out setting up the cartoon maker on a library computer or two in my new school, let's see what the boss says. 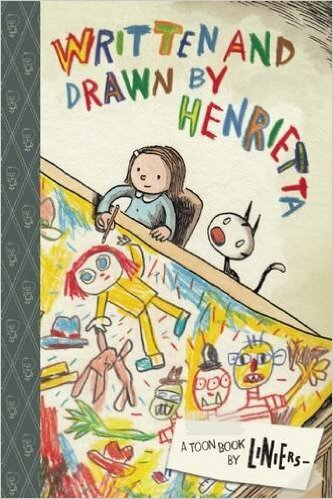 Just read Henrietta, love it and it will be useful in a beginners' way for hints on story writing.